How to use The Virtual Classroom? Step 1: Login to the Learnmet's Dashboard as Student or Teacher and click "Try Virtual Classroom" link on the Dashboard header or from above the post area of the Social Timeline. The system will take you to try Virtual Classroom page, where either you can try it yourself only, or you can invite up to five individuals to try it together. Step 2: Invite Friends, Colleagues, Parents, Teachers or anyone you know to try and feel the Virtual Classroom together. Type Meeting Subject, Type Follower or Followed Username to select users from the drop-down list, type email id(s) and use a comma(,) in between every email ids. Set Meeting duration (Use Minutes, if you don't set meeting duration the system will initiate a session for 30 mins) and click "START MEETING". If you want to try it just yourself then keep the email field and user field blank and click "START MEETING". The system will initiate a session with you and profile you a link on screen to start the session, and in a minute your virtual classroom shall start. Step 3: Click the link to start the session. The system will connect to the live server within 1 minute of clicking of Start Session Now. Step 4: System will connect to the live server, and will ask for the permission to allow the Microphone. Step 5: Allow the microphone to access audio-video session. Step 6: The Very first page will be the information page of Learnmet's Live Session, this page will explain how to use the Live session's UI. Step 7: Learnmet's live session provides screen share facilities, to start the screen share click "desktop" icon on the bottom right corner of the page. The system will ask to install the Chrome Extension to allow the process. Step 8: Add The Extension to continue. Step 9: After Installing the extension, click the "desktop" icon on the bottom right corner of the page again. Step 10: The system will show a popup with a selection option if you have more that one monitor, but if you have a single monitor system will start the screen sharing process. Step 11: Screen share will start, and preview will be in the full window. Step 12: To Stop the Screen Sharing, click the same "desktop" icon. Step 13: To Video conference, click the "Camera" icon and allow to share the web camera. Step 14: To Stop the video conference just click the "Camera" icon again. Step 15: Upload Presentation file by clicking Plus Button (+) and click Upload Presentation button, present in the bottom left of the page. Step 16: Select the presentation files from the computer and click the start button. Step 17: Upload as many files needed for presentation, by the same way. 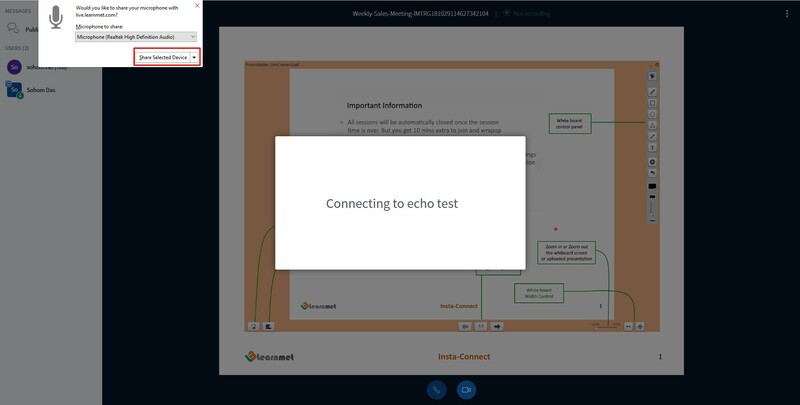 Step 18: Use Live Session Tools and a blank page to start a fresh presentation by clicking Right and Left Arrow Key on the bottom of the page. Step 19: Click Microphone Button on top to Mute or Un-mute yourself in the presentation, click on the username and click "Mute user" button to mute or un-mute other users in the presentation. Step 21: To manually log out from the Live connect, after complete the session just need to click 3dot button on Top Right corner of the page and click log out button, Or after scheduled time system will automatically log you out from the live Server.